NEW YORK - He was noted for his passion for-and achievements in-multiple genres of music, from symphonies to Broadway shows. Leonard Bernstein-conductor, composer, pianist, teacher and author-was honored by the U.S. 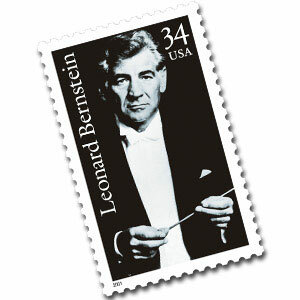 Postal Service yesterday with the issuance of the Leonard Bernstein commemorative stamp. The stamp is available at post offices nationwide beginning today. The first day of issuance ceremony was held prior to the first concert of the New York Philharmonic AOL Time Warner Concerts in the Parks series in Central Park. The July 10 concert, which was conducted by William Eddins, showcased music of Bernstein and Prokofiev and featured violinist Joshua Bell. "This is an exciting opportunity for the Postal Service to showcase the richness and diversity of the U.S. stamp program," said John F. Walsh, a member of the Postal Service Board of Governors, who dedicated the stamp. "Leonard Bernstein made a significant contribution to the culture of our nation and to the world, and we are proud to issue this stamp honoring his numerous accomplishments." "We, at the New York Philharmonic, are delighted to be sharing this special occasion which will honor our illustrious Laureate Conductor Leonard Bernstein," said New York Philharmonic Executive Director Zarin Mehta. "Thanks to the U.S. Postal Service, the unveiling of this postage stamp at this concert will make the evening especially memorable for the people of this great city, Bernstein's home." Joining Walsh was Paul B. Guenther, New York Philharmonic Board Chairman; Gerald M. Levin, AOL Time Warner CEO and Zarin Mehta, New York Philharmonic Executive Director. Other participants included Schuyler Chapin, New York City Cultural Affairs Commissioner; Henry Stern, New York City Parks & Recreation Commissioner and C. Virginia Fields, Manhattan Borough President. Bernstein was born in 1918 in Lawrence, Mass., and began piano lessons as a boy. He graduated from Harvard University in 1939 with a degree in music. The young musician continued his studies at the Curtis Institute of Music in Philadelphia, earning a diploma in conducting in 1941. He also received training at the Berkshire Music Center at Tanglewood, Mass. In August 1943, Bernstein was named assistant conductor of the New York Philharmonic. On Nov. 14 he substituted for guest conductor Bruno Walter and led the orchestra through its entire program in a nationally broadcast concert at Carnegie Hall. The reviews-including front page coverage in The New York Times-were enthusiastic, and soon orchestras worldwide were inviting him to serve as guest conductor. From 1945 to 1957, Bernstein was the music director of the New York City Symphony orchestra. In 1958, he was appointed music director of the New York Philharmonic, the first U.S.-born and trained conductor to hold that position. He retired from the New York Philharmonic in 1969 to become laureate conductor. On Dec. 15, 1971, he conducted his 1,000th concert with the Philharmonic; an unprecedented achievement in that orchestra's history. Bernstein composed symphonies, chamber music and vocal music, as well as works for ballet, opera, film and the Broadway musical stage. Several compositions celebrate his Jewish heritage, including the symphonies "Jeremiah" and "Kaddish." Among his other works are the symphony "The Age of Anxiety," the ballet "Fancy Free," and the operas "Trouble in Tahiti" and "A Quiet Place." His many contributions to musical theater include scores for "On The Town," "Wonderful Town," the comic operetta "Candide" and "West Side Story," which was made into an Academy Award-winning film. He received an Academy Awardr nomination for his score for the film "On The Waterfront." Over the years Bernstein garnered many honors, including several Emmyr and Grammyr awards. He died in 1990, just a few days after announcing his retirement from public performances. The stamp, designed by art director Howard Paine of Delaplane, Va. features a black-and-white photograph taken in June 1968 by Don Hunstein, then a photographer for Columbia Records. Hunstein specialized in photographs of musicians and has photographed, among others, Bob Dylan, Miles Davis, Duke Ellington, Bobby Short and Garrick Ohlsson. This is Hunstein's first stamp for the Postal Service.